Before anything can work, the SD card needs to be connected to the BusPirate. 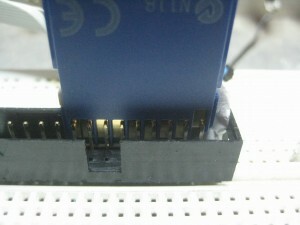 A specific connector could be used, however its easier and cheaper to hack it. A SD card fits neatly in a standard 0.1″ header and with a bit of paper to provide some extra pressure it works like a charm. I have removed the second row of pins from the header to make it easier to fit in the breadboard. The BusPirate is connected directly to the card and Vpu needs to be connected to 3.3v for the pull up resistors. The numbers indicate the SD card pin number. Pins 8 & 9 are used as additional data lines for faster transers and are not used in SPI mode. The BusPirate is set up to use SPI mode, with open drain and pullups on. This particular SPI bus needs an idle low clock, with data being output on the idle to active transition and data getting sampled at the end of the bit cycle. 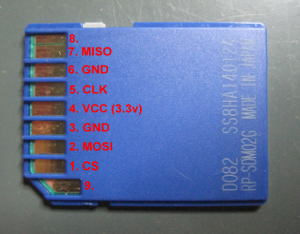 SD Cards start out in SD mode and needs to be put into SPI mode. This is accomplished through sending the card a reset command (CMD0) with CS held low. The card also needs 80 clock cycles for initialisation before being sent any commands. All SD commands are 6 bytes long, beginning with the command number ORd with 0x40, a 32-bit argument (big endian) and then a checksum. In this case the argument (parameters) for the reset command are 0 and the checksum needs to be valid. Once in SPI mode the checksum is disabled and arbitrary data can be sent in its place. 8 bytes are read back after the command is sent to get the response byte. Returned data of 0xFF indicates that the bus is idle or the card is processing and will give a response shortly. The card is now is in SPI mode and in the IDLE state, shown by the 0x01 response and needs to be moved into the operating state through CMD1 (SEND_OPERATING_STATE). This command is repeated until the card comes out of the IDLE state. Before transferring any data, the block transfer size needs to be set through SET_BLOCKLEN (CMD16). We will read and write a block of 512 bytes at a time, the standard sector size. A sector is read with the READ_SINGLE_BLOCK (CMD17) command, supplied with the address of the sector as the argument. The SD card that I am using in this example is already partitioned and formatted, so dumping the first sector (offset 0) will guarantee that data is present and allow for verification. The response of the card is different to the previous commands. Firstly a response of 0x00 was received, indicating a successful command. 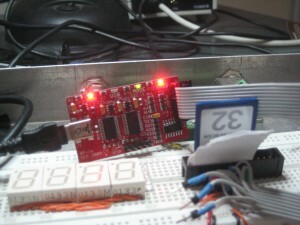 After a bus idle time 0xFE was received, this is the Start block token and 512 bytes of sector data follow it. Finally the data ends with 0xC2 0xC3, a CRC-16 based checksum of the send data. Verifying the data we see 0x55 0xAA as the last two bytes of the sector, which isthe signature for Master Boot Records. The information at offset 0x1BE gives the entry for the first and only partition. 0x00 0x01 0x14 0x00 0x04 0x03 0x60 0xDA 0x33 0x00 0x00 0x00 0x4D 0xED 0x00 0x00. Which is a non bootable, DOS 3.0+ 16-bit FAT file system, starting at sector 0x33 (51) and continuing for 0xED4D (60749) sectors, or 31103488 bytes. So we can read, but can we write? Writing uses a similar structure to reading but before we write data we need a location to write it to. Going back to our partition table, the filesystem doesn’t start until sector 51 which leaves sectors 0 – 50 free and which should be empty. Lets check. Yup sector 1 (offset 0x200) if empty and filled with zeros. Writing is performed in two steps, first a write command of WRITE_SINGLE_BLOCK (CMD24) is sent specifying the location that we want to write to. The card is happy with us writing to offset 0x200 (sector 1). Next a Start Block token is sent, then the data, then a checksum. We don’t need to worry about the checksum values as checksumming has been disabled. The card indicated that the write was a success (0xE5) then it went into busy mode, effectively tying the data out pin low. The card cannot be sent another command until the bus is idle again (0xFF). Here we filled the sector with 0xFF, now lets check that it worked. Looks like the data made it onto the card. According to the SD card specification, we are not observing the correct way to initialise a card and some cards (1.4mm thick) will fail to initialise, however the presented method should also be good for using MMC cards. The standard states that memory corruption could occur due to differing fields in some registers. We could also gather more information from the card, including its storage size before using it. This entry was posted on February 11, 2010, 9:30 pm and is filed under Hack. You can follow any responses to this entry through RSS 2.0. You can leave a response, or trackback from your own site. I had this SD card reader laying around that I never managed to get working. Then I tried your setup with the BusPirate and it worked like a charm !! Thanks a lot for this nice tutorial. Keep up the good work! This is great, I was looking all over for someone who was making use of their old FDC connector. I know that you mainly used the FDC connector to SD in a project, but just wondering, did you happen to try reading an sd from the FDC on a pc motherboard? If this was possible I assume that one could use it as a boot device, perhaps for EFI, like a bootleg EFI-X without having to pay 200$ or use boot 132… or maybe just a way to read SD.